If you're looking for a gorgeous and unique style of engagement ring, consider one inspired by the Victorian era. Ranging from simple settings featuring semi-precious stones to ornate designs set with gems, these rings offer a beautiful alternative to the contemporary styles in your local jewelry shop. Whether you're considering an authentic antique ring or a replica Victorian style, there's lots to love about these designs. The Victorian era began with Queen Victoria's ascension to the throne in 1837 and continued through the first years of the 20th century. According to Victoriana Magazine, Queen Victoria adored jewelry and had a significant impact on the styles that were popular during her reign. During this period of more than 50 years, there were a number of different materials, decorative motifs, and styles that had an important affect on jewelry design. You'll find one or more of the following elements in most Victorian engagement rings. The Art Nouveau Lady Ring (pictured) from Antique Jewelry Mall represents one of the iconic motifs from this era: the beautiful woman. This gorgeous 14k yellow gold ring is modeled after an example from 1910. It features a woman's face and twining hair, as well as elaborate roses and a 0.9-carat, round brilliant cut garnet. Available in sizes four through 9.5, it retails for $620. Floral rings, such as the Antique Style Filigree Setting from Jan's Jewels, were extremely popular during this period. This sweet ring setting, available in your choice of precious metal, is cast from an original period ring mold. You can choose to have it set with the gem of your choice. The setting comes in sizes four through ten and starts at about $300. 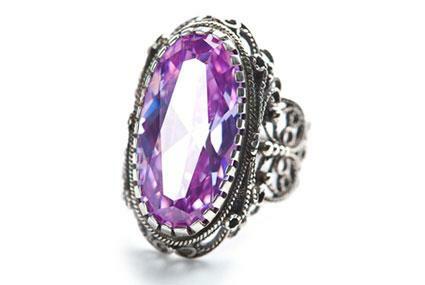 The Dearest Ring (pictured) from The London Victorian Ring Company is emblematic of this era. The first initials of the gems in this 18k yellow gold beauty spell out the word "dearest": diamond, emerald, amethyst, ruby, another emerald, sapphire, and turquoise. The round cut gems range from 0.06 to 0.09 carats each. 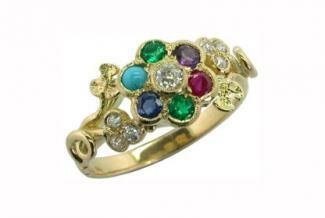 This ring is made to order in your size and retails for 930 British pounds. Shipping to the United States is about 70 pounds. 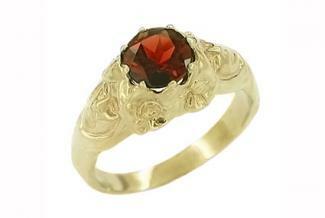 Garnets, which symbolize loyalty, were a symbolic choice for engagement rings from the Victorian era. Designs like the Victorian Almondite Garnet and Seed Pearl Ring from Antique Jewelry Mall offer a sentimental statement about fidelity. This gorgeous 14k yellow gold ring features a 10-millimeter by 12-millimeter oval garnet surrounded by tiny pearls. It is a size seven and can be resized to fit you. It retails for just under $800. 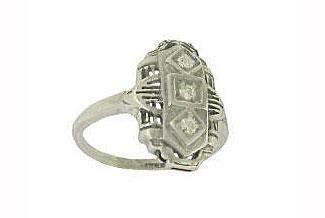 The Antique Style Filigree Diamond Ring (pictured) from Antique Reflections is crafted from affordable sterling silver. It features three diamonds, totaling 0.06 carats, and has a beautiful geometric design. It comes in an unusual size (5.25), but it can be resized to fit you. This design retails for $165. The Victorian Three Stone Diamond and Sapphire Ring from The London Victorian Ring Company is emblematic of the period. A 0.77-carat oval sapphire is flanked by two sparkling oval diamonds, totaling 0.51 carats. This stunning 18k yellow gold design comes in most sizes and retails for 1,690 British pounds. Shipping to the United States is just under 70 pounds. If you want an engagement ring that actually graced a bride's finger during the Victorian era, you can choose to purchase an authentic antique ring. You'll find these rings in local antique stores, as well as online. Buying antique engagement rings requires research, but by doing your homework, you can end up with a gorgeous piece of jewelry that comes with its own romantic story. If you're a fan of the beautiful and symbolic motifs popular during the last half of the 19th century, then a Victorian engagement ring may be perfect for you. Pair it with a beautiful Victorian wedding band for a complete look that harkens back to a past era of romance.